Attock, Punjab. Fort & Bridge of Boats. bl.uk > Online Gallery Home	> Online exhibitions	> Asia, Pacific and Africa Collections	> Attock, Punjab. Fort & Bridge of Boats. 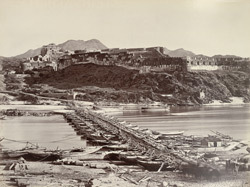 This view of the fort at Attock was taken by William Baker in the 1870s and forms part of an album entitled 'Photographs of India and Overland Route'. The bridge over the Indus River at Attock is the gateway to the North-West Frontier from the Punjab. The fort on the Punjab side was built by the Mughal Emperor Akbar in 1581 to support his military campaigns in Afghanistan; the location continues to have great strategic importance even today. Vulnerable from attack through the Khyber Pass to the north, the Punjab (literally 'five rivers') is dotted with such forts, bastions of defense against Central Asian invaders.